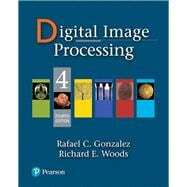 by Gonzalez, Rafael C.; Woods, Richard E.
For 40 years, Image Processing has been the foundational text for the study of digital image processing. The book is suited for students at the college senior and first-year graduate level with prior background in mathematical analysis, vectors, matrices, probability, statistics, linear systems, and computer programming. As in all earlier editions, the focus of this edition of the book is on fundamentals. The 4th Edition, which celebrates the book’s 40th anniversary, is based on an extensive survey of faculty, students, and independent readers in 150 institutions from 30 countries. Their feedback led to expanded or new coverage of topics such as deep learning and deep neural networks, including convolutional neural nets, the scale-invariant feature transform (SIFT), maximally-stable extremal regions (MSERs), graph cuts, k-means clustering and superpixels, active contours (snakes and level sets), and exact histogram matching. Major improvements were made in reorganizing the material on image transforms into a more cohesive presentation, and in the discussion of spatial kernels and spatial filtering. Major revisions and additions were made to examples and homework exercises throughout the book. For the first time, we added MATLAB projects at the end of every chapter, and compiled support packages for you and your teacher containing, solutions, image databases, and sample code. Rafael C. Gonzalez received the B.S.E.E. degree from the University of Miami in 1965 and the M.E. and Ph.D. degrees in electrical engineering from the University of Florida, Gainesville, in 1967 and 1970, respectively. He joined the Electrical and Computer Engineering Department at University of Tennessee, Knoxville (UTK) in 1970, where he became Associate Professor in 1973, Professor in 1978, and Distinguished Service Professor in 1984. He served as Chairman of the department from 1994 through 1997. He is currently a Professor Emeritus at UTK. Gonzalez is the founder of the Image & Pattern Analysis Laboratory and the Robotics & Computer Vision Laboratory at the University of Tennessee. He also founded Perceptics Corporation in 1982 and was its president until 1992. The last three years of this period were spent under a full-time employment contract with Westinghouse Corporation, who acquired the company in 1989. Under his direction, Perceptics became highly successful in image processing, computer vision, and laser disk storage technology. In its initial ten years, Perceptics introduced a series of innovative products, including: The world's first commercially-available computer vision system for automatically reading the license plate on moving vehicles; a series of large-scale image processing and archiving systems used by the U.S. Navy at six different manufacturing sites throughout the country to inspect the rocket motors of missiles in the Trident II Submarine Program; the market leading family of imaging boards for advanced Macintosh computers; and a line of trillion-byte laserdisc products. He is a frequent consultant to industry and government in the areas of pattern recognition, image processing, and machine learning. His academic honors for work in these fields include the 1977 UTK College of Engineering Faculty Achievement Award; the 1978 UTK Chancellor's Research Scholar Award; the 1980 Magnavox Engineering Professor Award; and the 1980 M.E. Brooks Distinguished Professor Award. In 1981 he became an IBM Professor at the University of Tennessee and in 1984 he was named a Distinguished Service Professor there. He was awarded a Distinguished Alumnus Award by the University of Miami in 1985, the Phi Kappa Phi Scholar Award in 1986, and the University of Tennessee's Nathan W. Dougherty Award for Excellence in Engineering in 1992. Honors for industrial accomplishment include the 1987 IEEE Outstanding Engineer Award for Commercial Development in Tennessee; the 1988 Albert Rose Nat'l Award for Excellence in Commercial Image Processing; the 1989 B. Otto Wheeley Award for Excellence in Technology Transfer; the 1989 Coopers and Lybrand Entrepreneur of the Year Award; the 1992 IEEE Region 3 Outstanding Engineer Award; and the 1993 Automated Imaging Association National Award for Technology Development. Gonzalez is author or co-author of over 100 technical articles, two edited books, and four textbooks in the fields of pattern recognition, image processing and robotics. His books are used in over 500 universities and research institutions throughout the world. He is listed in the prestigious Marquis Who's Who in America, Marquis Who's Who in Engineering, Marquis Who's Who in the World, and in 10 other national and international biographical citations. He ii is the co-holder of two U.S. Patents, and has been an associate editor of the IEEE Transactions on Systems, Man and Cybernetics, and the International Journal of Computer and Information Sciences. He is a member of numerous professional and honorary societies, including Tau Beta Pi, Phi Kappa Phi, Eta Kapp Nu, and Sigma Xi. He is a Fellow of the IEEE. Richard E. Woods earned his B.S., M.S., and Ph.D. degrees in Electrical Engineering from the University of Tennessee, Knoxville in 1975, 1977, and 1980, respectively. He became an Assistant Professor of Electrical Engineering and Computer Science in 1981 and was recognized as a Distinguished Engineering Alumnus in 1986. A veteran hardware and software developer, Dr. Woods has been involved in the founding of several high-technology startups, including Perceptics Corporation, where he was responsible for the development of the company’s quantitative image analysis and autonomous decision-making products; MedData Interactive, a high technology company specializing in the development of handheld computer systems for medical applications; and Interapptics, an internet-based company that designs desktop and handheld computer applications. Dr. Woods currently serves on several nonprofit educational and media-related boards, including Johnson University, and was recently a summer English instructor at the Beijing Institute of Technology. He is the holder of a U.S. Patent in the area of digital image processing and has published two textbooks, as well as numerous articles related to digital signal processing. Dr. Woods is a member of several professional societies, including Tau Beta Pi, Phi Kappa Phi, and the IEEE. What Is Digital Image Processing?